It wasn’t that long ago that we had our first report of the upcoming film about Churchill. This time it’s about the end of the first part of the film making process. June 27, 2016: Salon Pictures today announced the end of production on the highly anticipated new feature film CHURCHILL, which follows the eponymous icon in the days preceding one of the most important events in world history: D-Day. The five week shoot took place across various locations in Scotland, including Glasgow and Edinburgh. As tensions mount in the days preceding D-Day, the now-beleaguered Prime Minister Winston Churchill, played by Brian Cox (The Bourne Supremacy, X-Men 2, Zodiac, War & Peace, Troy), must prepare a final attempt to crush Hitler’s encroaching army. With the entire War effort ultimately hinging on this decision, the stakes have never been higher. As the Wartime leader clashes with his generals, tension builds with the Americans, and Churchill must wrestle his inner-demons in order to navigate the Allies to victory. Miranda Richardson (Harry Potter, Testament of Youth) plays his beloved wife Clemmie Churchill, with John Slattery (Mad Men, Captain America Civil War) as General Eisenhower, James Purefoy (Rome, The Following, High Rise) as King George VI, and rising-star Ella Purnell (Miss Peregrine’s Home for Peculiar Children, Tarzan) joining the cast as Churchill’s secretary. Further casting on the project showcases a host of renowned British talent, including Julian Wadham (War Horse, The English Patient), Danny Webb (Valkyrie, A Little Chaos), George Anton (Marcella, The Sweeney) Steve Cree (Brave) and Richard Durden (Wolf Hall, From Paris With Love). 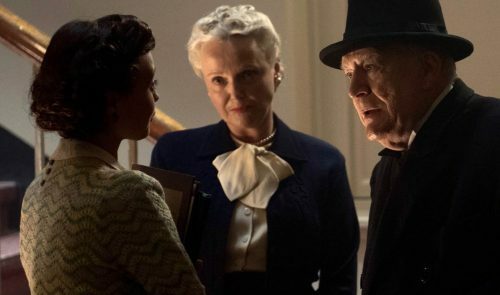 Directed by Jonathan Teplitzky (The Railway Man, Marcella) and written by British historian and author Alex von Tunzelmann in her feature debut, CHURCHILL is a unique, challenging and intimate portrait of the man behind the public figure, widely regarded as the Greatest Briton of all time. CHURCHILL was developed with the assistance of the BFI, Nick Taussig and Paul Van Carter of Salon Pictures are producing, with Piers Tempest and Jo Bamford’s Tempo Productions, alongside Claudia Bluemhuber of Silver Reel. Embankment Films’ Tim Haslam and Hugo Grumbar are handling international sales, Silver Reel finance with Lipsync and Creative Scotland.